According to “The Dynamic Media, Sera, and Reagent Market in Biotechnology”, a 2010 report from BCC Research, sales of cell culture media, sera, and reagents will grow from $2.3 billion in 2009 to an estimated $3.9 billion by 2015. Global demand for media is creating a boom industry, and not only for pure-play media companies. For example, in December 2011, Corning Life Sciences acquired Mediatech, a VA-based manufacturer of Cellgro® brand media, basal salt solutions, antibiotics, sera, and specialty media; in August, GE Healthcare Life Sciences acquired PAA Laboratories, which researches and manufactures cell culture products for producing vaccines and therapeutic proteins. Media supply has become a huge issue with the rise of biotech in Asia. In 2010, Irvine Scientific opened an 18,500 square-foot cell culture media manufacturing facility in Tokyo. Irvine commissioned the facility to serve the growing demand for media in Japan and elsewhere in Asia, and to provide “redundancy” with its 75,000 square-foot facility in Santa Ana, CA, to which it added a 23,000 square-foot warehouse in early 2011. The first products rolled off the Tokyo facilities production line in April 2011. Country of origin has become a major quality parameter for media and ingredients, which is one reason why biomanufacturers prefer to source close to home. Quality auditing and animal-component-free audits extend back to the suppliers of ingredients and equipment used to make media components, not just the media itself. Thus, media ingredient suppliers must maintain manufacturing systems and employ ingredients that may be verified and validated according to their customers’ needs. PAA was the latest in a line of GE acquisitions that began with its purchase of Amersham in 2004, followed by Whatman (filtration) and Wave Biotech (disposable process containers). GE’s business strategy continues to provide a “scalable, start-to-finish bioprocess solution,” says Harry Brack, formerly COO at PAA and currently with GE. Before the merger, PAA had invested heavily in media manufacturing and a product portfolio that extends from research to manufacturing scale. The PAA business segment is expected to grow to global proportions with the help of GE’s financial and global marketing presence. Media development has reached a plateau of sorts with respect to the most significant trend of the 2000s: a shift from serum- and animal component-containing media to serum-free and chemically defined media. “We’ve come to the end of that particular story,” Brack explains. What remains to be done amounts to fine-tuning media for specific CHO strains, and optimizing feed strategies. Production yields and volumetric productivity are similarly leveling off according to Brack, who does not expect that titers will rise anywhere nearly as dramatically over the next decade as they have since 2002. That does not mean that large-scale bioprocessing will be standing still. Enhancements will come in the form of compressed development and cycle times, shorter time-to-market, and higher product quality through clone selection rather than media improvements. If anything, cell culture development is shifting toward more highly targeted but simplified strategies employing platform media and simplified feeding strategies through which cells grow easily without optimization or adaptation. “These approaches streamline the process of going from clone to clinical material,” says Brack. Merck Millipore is relatively new to the cell culture media market. Its fledgling business is based on Merck Group’s long experience with chemical raw materials and processing, which is ideally suited to the larger industry trend toward chemically defined media, according to Jörg von Hagen, Ph.D., head of process development at the company. Merck Group has two cell culture media teams. Merck’s Woburn, MA, facility concentrates on proprietary CHO media, while its Darmstadt, Germany, unit focuses on customized GMP media and feeds. The German business, which works on animal-derived component-free (ADCF) products as well as media with animal-derived ingredients and chemically defined cell culture media, takes recipes from European and Asian customers and scales them up for production. “We hope to leverage this expertise for North America as well,” Dr. von Hagen says. Merck Group will restrict its target market to GMP pilot-scale and production-scale processes, which makes sense given the company’s strong regulatory and GMP credentials and expertise in sourcing high-quality chemical ingredients. “We want to produce tons rather than liters,” Dr. von Hagen adds. Duplicating media for an established process can be difficult. Media suppliers never disclose the “secret sauce” that makes their products work with specific cell lines. Ingredients do not strictly follow Chemical Abstracts Services “CAS numbers”—unique identifiers for chemical ingredients. Ingredients as well-characterized as bovine serum albumin may differ significantly in purity, composition, and activity depending on the source and manufacturer. The same is true for media additives like glucose or sodium chloride, or in the case of supplemental feeds, amino acids. Media purity has become increasingly important as well. Several vendors now sell filters specifically designed for cell culture media. For example Pall offers the disposable Novasip Ultipor VF media filtration capsule filters, and Millipore’s Express SHC and SHR filters are used for scaleup of cell culture culture media. In December, 2011, Thermo Fisher Scientific introduced a 0.1-micron polyethersulfone membrane specifically for filtering media. InVitria will use two of its products, Optiferrin (recombinant transferring, an iron-carrying protein) and Cellastim (recombinant human albumin) to increase consistency and performance, and in the case of Optiferrin, the elimination of the downstream purification burden of iron chelators. In early 2011, InVitria presented data demonstrating a significant improvement in performance for stem cell culture media containing these two proteins. 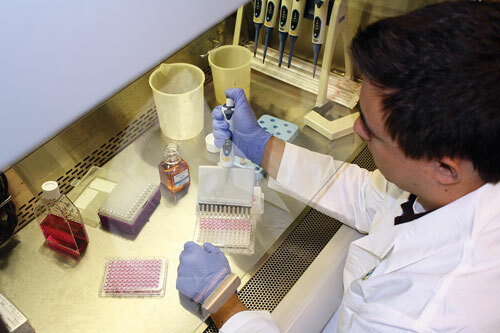 Researchers at InVitria conduct experiments using animal component-free cell culture supplements at the firm’s cell culture lab in Fort Collins, CO. The “final frontier” for revolutionary media development may lie in markets other than traditional mammalian cell culture-based manufacturing, particularly in stem cells and media for “non-traditional” expression systems. Numerous vendors offer media for stem cell cultures. Through its Chemicon business unit Millipore sells HEScGRO™ animal component-free media for human embryonic stem cells; Stemgent’s NutriStem™ media is fully defined and animal component-free; Life Technologies sells several types under the Gibco brand, including StemPro® for neural stem cells, as does Aruna Biomedical with its AB2™ Neural Progenitor Expansion media Kit. Through its Hyclone brand Thermo Scientific sells a range of products for both human embryonic and adult stem cells. One tends to think of stem cell media as being radically different from conventional cell culture media, but this is not the case. Stem cell media consists of conventional cell nutrients such as lipids, vitamins, minerals, and amino acids, plus a proprietary blend of cytokines and co-factors that favor expansion or differentiation. If anything, stem cell culture media are evolving toward greater simplicity—a recapitulation of media/feed strategies for biopharmaceutical manufacturing. A paper in the May 2011 issue of Nature Methods by James Thomson at the University of Wisconsin describes a stem cell culture medium, E8, that has been stripped of all unnecessary components. Chemically defined E8 medium reduces variability in human embryonic and induced pluripotent stem cell cultures resulting from inconsistencies in albumin. E8 contains no albumin at all, and was pared of other ingredients that Thomson and co-workers deemed to be unnecessary. Thomson found that albumin was required to reduce the toxicity to cells of mercaptoethanol, so he omitted this ingredient and found that albumin was no longer required. David Welch, Ph.D., senior market development manager at Life Technologies, describes such media as “lean” media—both cost-effective and efficient at maintaining stem cells in whatever state of potency is desired. 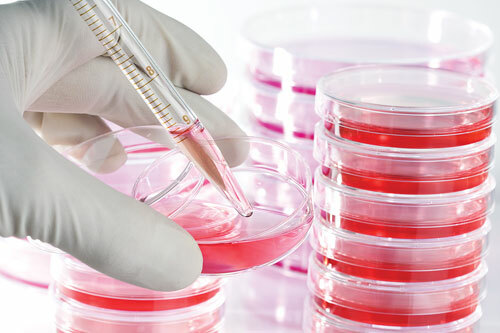 Trends in stem cell culture media have moved toward defined varieties such as Life Technologies’ StemPro MSC SFM, which is free of animal products and cleared by the FDA for use in clinical trials. Alternative expression systems remain the Rodney Dangerfields of biomanufacturing, yet they continue to generate interest. A 2010 paper in Plant Biology Journal reported that algal cell culture can compete with bacterial and mammalian cell cultures for the production of therapeutic proteins. The authors, among them Stephen Mayfield at the University of California, San Diego, and scientists from Hayward, CA-based protein-engineering firm ProtElix, demonstrated the feasibility of producing a variety of therapeutic proteins, including cytokines, VEGF, and antibodies in inexpensive algal cultures. Algal cultures are much more robust than mammalian cell culture and, unlike bacteria, produce properly folded, glycosylated proteins. Most salient: In the paper, Mayfield noted that algae were “considerably cheaper” than mammalian expression systems. As with stock CHO cell culture media, end-users prefer “take out” to home cooked. Algal media is simple, consisting mostly of salts and minerals. (Being plants, algae employ carbon dioxide as their carbon source.) 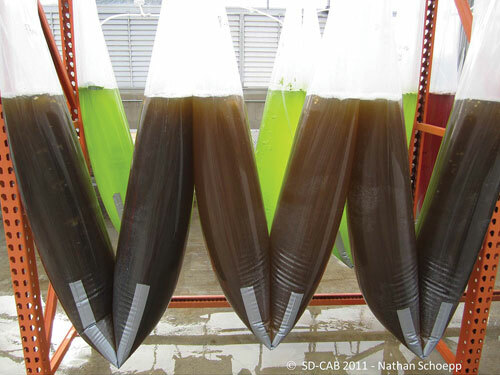 “As we spoke with customers, we heard that making up algal media is a pain,” says Lisa Stillwell, product development manager at Life Technologies, which claims to be the “first to market” for algal media under the Gibco brand. These products, Stillwell notes, are “significantly less complex” than CHO media. Some provide little more than minerals and elements—no vitamins, amino acids, or undefined components like hydrolysates or animal sera, although some algae require acetate as the carbon source for optimal growth.